Because everyone in Portland has a yoga mat. 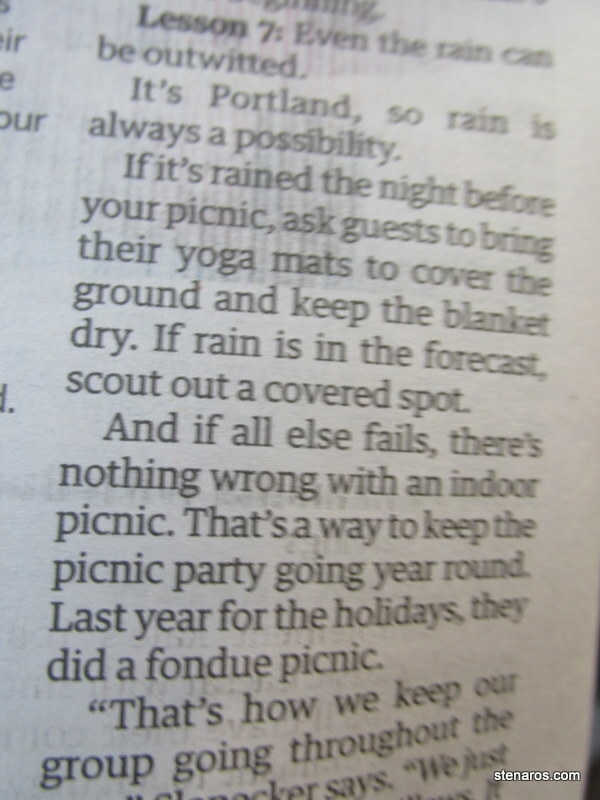 From a story in the paper about a group of friends that gets together and regularly has picnics. Don’t forget your yoga mat, folks! We know you own one! Posted on May 27, 2015 February 3, 2016 Categories All (-ish), To Occupy my TimeTags humor2 Comments on Because everyone in Portland has a yoga mat. Our volunteer Mary is the best. Mary is a woman in her 80s who volunteers once per week at school. She is full of fun and a kindred spirit of sorts, because she loves to go on walks and take pictures. First, I must give you background. Here is the sign on the inside of the door to the teacher bathroom. This sign has been here as long as we have. It came with the building. Here are the lockers in the corner of the teacher bathroom. And here are labels on the lockers. The lockers came to us second-hand, so we have no idea who these guys are. Charlie’s locker used to have a small sticker that said, “Fish On!” but it fell off a few years ago. And here’s the poem that appeared on the side of the locker one day. Mary left it anonymously, but we figured her out. to some artful, anoymous wit. and not nobody never gets hit. Posted on June 7, 2013 February 3, 2016 Categories To Occupy my TimeTags humor1 Comment on Our volunteer Mary is the best. The highlight of my day came early on while reading the Oregonian’s Metro section. The headline: No racial intent or race-related outfits at Cleveland High’s ‘bro vs. hipster’ theme day. It seems that it is Spirit Week at Cleveland High school. Spirit week apparently involves dressing up in themed clothing just as I did during my high school spirit week days, but Cleveland High has a “versus” theme. For example, ninjas vs. pirates or bros vs. hipster. My first reaction was to laugh and think, “um, they are dressed exactly alike. They are both wearing sorts and t-shirts.” My next reaction was, “ah. I’m officially old.” If I turned on my young person vision I saw that the two groups were profoundly different. The bros were outfitted in baggy shorts, and sleeveless shirts, sunglasses and sandals. The hipsters were wearing skinny jean shorts, t-shirts with flannels and nerdy glasses. Ah. It reminds me of a spirit week theme day my senior year (spring of 1993) when we had a theme of “early 80s day.” I was telling my Pizza Hut manager (read: old person) about the themes and when I got to that one he said, “I went to high school in the early 80s and I wore jeans and a t-shirt. How is that different from now?” I (then: young person) just shut my mouth to avoid trying to explain what my friend later put so succinctly: yes, but what kind of jeans, how tight were they, what was on your t-shirt and what shoes were you wearing? It seems that I’m not the only one tired of overblown forecasts. Note: image is “big” and if you click on it, it will be more readable. I don’t just feel this way about soccer. Pretty much all spectator sports have me yawning. I left these big so you can click and read them. Get Fuzzy Had a great World Cup week. Bucky and I seem to have the same view of soccer. Though, of course I don’t begrudge people for playing soccer, or watching it. At first I thought it was tax tips for chefs or restaurant owners and that made sense to me. But then I read on and found that either the Tax Department has a division of Retarded and Developmentally Disabled workers who created this guide, OR the Tax Department’s Employees (not retarded) made this guide for the Retarded and Developmentally Disabled. But then I’m not sure where the culinary part comes in. Maybe the RDD people work in kitchens? Maybe the Tax Department’s employees are spicing up the title with a fun word like culinary? Like many, many things in life, I will never know the answer. I can’t tell if they are joking or not. I made a vat of hummus for our Spindrift trip. The hummus also came with celery and carrots for dipping and, of course, pita bread. After we got home, I happened to look at the label and laughed long and hard when I read the diagrams for the suggested ways to cut the pita bread. Oh yes! Those two cuts are THE EXACT SAME CUT AS the sandwich cut. They are just rotated. Hmmm, I really want to make the “cold cuts” cut, because I’ve got this delicious roast beef. But what should I do if I’m making tiny roast beef sandwiches for snacks? Which cut should I use? Oh wait! It turns out that the Hors d’oeuvres/Snack Cut and the Cold Cuts cuts are THE EXACT SAME CUT! I’m really hoping the graphic designer who created this packaging realizes this and is just having a laugh. Posted on May 26, 2010 February 3, 2016 Categories All (-ish), To Occupy my TimeTags food, humor1 Comment on I can’t tell if they are joking or not.